children absolutely fine-tunes your sense of time and time passing. Having just moved house from the metaphorical space of a football field to one of a five-a-side pitch, I have been starkly reminded of time passing, not to mention my relationship to space. Moving furniture, I uncovered a crudely but enthusiastically spelled message scribbled on the wall from my then seven-year-old. In essence it said "Hands off my Lego," but broadly speaking what it said to me was that time was seriously whizzing by. That hobbit we brought into the world was now taller than me. So family is a theme front and centre in Nolan's space epic and I find myself in sympathy with his family-based thread running all the way through his latest visually astonishing film. 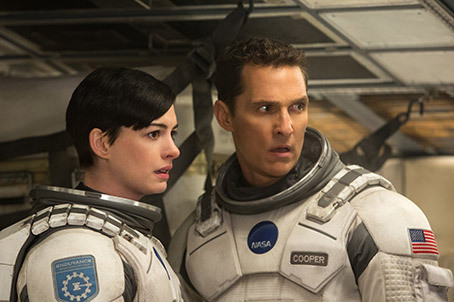 That one Anne Hathaway line from the trailer - "Love is the one thing that transcends time and space..." followed by a seriously emotional Matthew McConaughey has me thinking that this movie will not, alas, be this generation's 2001: A Space Odyssey (I will be very happy to be proved wrong). Kubrick's masterpiece managed to edge the human equation out of the room while the broader philosophical themes took centre stage. Astronauts Bowman and Poole were just facilitators, human cyphers to ease us into infinity (and beyond) and beyond conventional storytelling (see my Blu-ray 2001 review here). Now we are faced with a career-revitalised McConaughey blasting off to find another planet we can pollute to death. That's really all I got from the trailers and the pre-publicity hype. So how does Interstellar fare? First and foremost... Despite the IMAX-lite format (IMAX DMR is essentially a 35mm film up-scaling affair) and the fact that 66 minutes of Interstellar were shot in the true IMAX format (which you will not appreciate seeing it in the inferior DMR process), try hard to see this movie as an IMAX or IMAX DMR presentation. Multiplexes call their cinemas IMAX but they're being economic with the truth. Speaking of economics, that's a big "ouch," paying the inflated ticket prices but for this experience it was worth every penny. 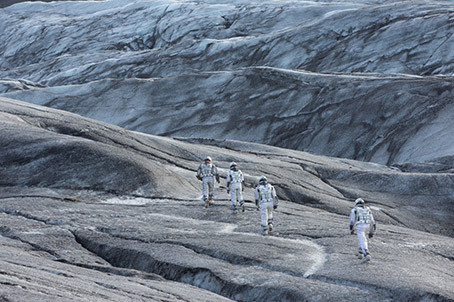 Interstellar needs to be seen as big as you can stand it, in a cinema with state of the art sound. There's sub-woofery going on in this movie that makes palms sweat and teeth rattle. As an audience, you are sitting next to the astronauts in their ships and feeling their emotions as the sights and sounds remind you just how far from Kansas you really are. The sound design is truly extraordinary and had my friend and I jumping out of our seats. There's a lot of scuttlebutt on the web about how the sound mix in the IMAX presentations is too loud drowning out the dialogue. The dissenting voices have a legitimate case. I missed many lines first time around (drawly accents don't help) but I sort of expected that to happen, so over-produced are the final mixes to event movies these days. If Nolan hadn't made such a fuss about the technical specs on the opening wave of distribution, I suspect people wouldn't be talking. Ironically in their case, they are being very clearly heard. There's also sadness inherent in Interstellar's release. Someone wrote somewhere this will probably be the last time 15 perforation 70mm IMAX film will be distributed in a celluloid format, so completely (read cheaper and more convenient) has the digital environment colonised the film industry. In the old days it was the size of the crowds of extras that told you how 'big' the movie was. Now, it's how many terabytes the CGI took to render out. Aside from the emotionally teasing score (more on the effect of Zimmer in the frame later), Nolan's space, like Whedon's and Kubrick's, is devoid of sound. I never met Kubrick but I would've loved to have asked him "If you are staying true to the fact that sound does not travel in a vacuum, why have music? Why be true to one aspect of space and then flatly contradict it by adding Viennese Waltzes?" I'm playing Devil's advocate. I don't have to tell you how much I adored and was affected by 2001. If the 'fake' presence of music in a movie is eliciting emotion, then why not sound effects? The finale of Star Wars would be only half as effective without the growls and shrieks of the empire's X-Wings. But trust me. Nolan, like Alfonso Cuarón in Gravity, plays the 'silent vacuum' card very cleverly and they both also really use the big screen. See this on any kit with lesser specs than a 50 inch plasma on Blu-ray, and some ships in the vastness of space may be barely visible. The plot is fairly straightforward. Food resources on Earth are in a planet-wide decline. Dust and blight plague the land. Ex-NASA test pilot, Cooper (McConaughey) is bringing up two children on his corn farm and the family house is also home to his father, (John Lithgow). Cooper's daughter, Murphy (Mackenzie Foy), is an intellectual prodigy making her teachers look small. She's convinced there's a ghost making things move in her bedroom. Father and daughter are very strongly bonded after the death of Cooper's wife and the worsening conditions are making their collective lives very difficult. The anomalies in Murph's room lead Cooper to believe that there are fluctuations in gravity around his daughter's bookshelf. For some reason this reminded me strongly of Amy Pond's predicament as a young girl with a crack in her bedroom wall in Matt Smith's first full outing as the Doctor in 'The Eleventh Hour'. The gravity anomalies are translated as a message (from whom or what?) interpreted as Earth coordinates... So far, so Close Encounters. What is in no doubt, given the pedigree of Kip Thorne, the theoretical physicist and executive producer, is the mathematical accuracy of the visualisations of the stellar phenomena. Apparently, working with the FX teams, Thorne elucidated a few theories about these phenomena and will be publishing papers on his discoveries. Thorne wins bets with Stephen Hawking so that's kudos on a plane of reality I can't even grasp. The ride through the wormhole is about as exciting as cinematic space travel gets. The morphing of the light and space (space-time?) around the craft creates a sort of concave/convex confusion that is at once baffling and startlingly beautiful. It's like travelling through slow subtle fireworks going off in a vat of Guinness, all swirled by the hand of God. Seriously cool. You get the impression the science is spot on with very few concessions to standard Hollywood space operas. Nolan attaches his cameras to space ships and except for tiny blips in the vastness of space, you never get a hero pass of any of the craft, a straight left to right close 'drive-by' of the hardware, standard in any space movie. Whenever the ship or shuttle is in flight, the camera is always bolted to its side, echoing the craft (in both senses) of the real IMAX space documentaries, an aspect Nolan fully intended. Matthew McConaughey is superb as Cooper. After being utterly seduced by his stellar turn in True Detective, I was prepared for him to be good but he really is Interstellar. He grounds it as contradictory as that sounds, makes us feel everything and his enormous piloting skill and decent honesty never transcend what you think is humanly possible. There's a wonderful exchange between Cooper and Brand as he announces he's going to do something. She says "Impossible," and he smiles and says (I'm half remembering) "No, necessary." Jessica Chastain as an older Murph keeps the Daddy-resentment boiling as she works with Caine to finish an equation that will deliver mankind to the stars en masse. The performances across the board are very good, echoing the care that's gone into the entire production. There are a few A.I. robots in the movie that allow some comic interaction. Their design is curious, like three large cricket wickets made of chrome with ninety-degree edges. They are enormously adept at movement despite their apparent clumsy gait. More to the point, they are believable. It delights me that Nolan screened The Right Stuff to prep his cast and crew. The first movie I worked on and it's an acknowledged classic, marvelous. And now, to the score; one can't help but admire Hans Zimmer. There are many tales about him that may or may not be true. He's the 'wall of noise' maker is the most common but he can still deliver emotional resonance. I thought the simplicity of Man of Steel's main theme was very moving. To read a rebuff to all the rumours, have a look at this page* written by a former and respectful employee of Zimmer's. It strikes me as being fair and honest (for all I know it may be completely made up but it feels authentic). Nolan's been quoted saying to Zimmer "It's time to reinvent. The endless string ostinatos need to go by the wayside, the big drums are probably in the bin." If, like me, you will have to look up 'ostinatos' I'll save you a few mouse clicks. Remember The Dark Knight's "Dud-duh-duh-duh, Duh-duh-duh-duh etc.? Those are ostinatos. Nolan gave Zimmer a one page outline of the story omitting the space travel elements (say, what?) and asked the composer to spend a day and come up with a piece. Nolan loved what he did and then sprang the science fiction hardware bombshell. Apparently the score kept the integrity of the first beloved family theme. I have to say that eking out thematic passages from the final mix is pretty difficult. The days of easily discernable themes seem to be long gone. Zimmer's reinvention for Interstellar (and this is after one viewing, the album's not available yet) is to do a passable impression of Philip Glass in his Koyaanisqatsi and Powaqqatsi days swirled in with some Ligeti. Zach Snyder used Powaqaatsi's stately minimalist sound for outer space in Watchmen, a cue that worked gangbusters. Zimmer also seems to be using a church organ sound-alike which is different for sure. I'll save my final thoughts on the score until I've heard it a few more times. But perhaps it's fair to say that while it worked very well, I wasn't as touched by the emotion the score elicited as much as I have been by James Newton-Howard's extraordinary work whatever the shortcomings of the pictures he's asked to compose music for. Essentially, I was thrilled by the film and its technical execution, not quite as moved as I suspect Nolan was aiming for but eventually, Interstellar slightly stumbles due to the syndrome I'm going to christen 'blockbuster reductionism'. In order to make the movie accessible you have to reduce theoretical physics down to paper folding sound bites, reduce fourth and fifth dimensions to two and three so we can comprehend or at least have an opinion about what happens when the senders of the message really intervene. The resulting scene (which I will not spoil in any way) will confound and frustrate as many as it delights. Remember, even Kubrick opted out of showing the intelligence that placed the monoliths of Earth and the moon preferring to keep them in the sound track of the climax only. Spielberg boasted in the title of Close Encounters that we were going to see aliens and see them we did but even then, only just. There was so much light behind the ETs, they might as well have been little girls with big alien heads on... ahem. So, go for the physical experience, open yourself up to the ideas on show and marvel at some time-bending effects work, wonderful performances and the ambition of a filmmaker who still wants to be original in a sea of sequels and pre-digested ideas. For that alone, despite the required dumbing down, Nolan should be applauded.